Your app will have many scenarios that require no conditional logic. For example, examine door might always return the output, "It's a heavy wooden door." These "vanilla" scenarios can be completely defined within the Scenarios editor, but when you need conditional logic the Scripts editor is the place to start. 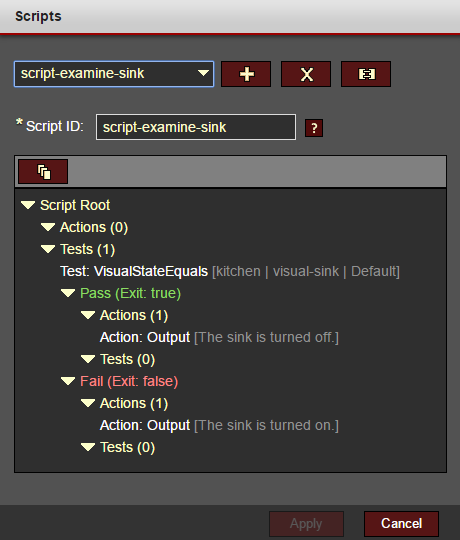 The examine sink scenario (defined in Scenarios editor) triggers the script-examine-sink script. Actions directly under Script Root execute first. In this case, there aren't any. The VisualStateEquals test checks if the visual-sink visual is in the Default (off) state. Based on whether the test passes, the character tells you whether the sink is on or off. Note that the Pass/Fail results are also containers for additional actions and tests. This recursive structure gives you the power to create flexible, intelligent sequences. When you open the Scripts editor and add a new script, you'll start with an empty tree. As you click on various nodes of the tree, buttons will appear which allow you add/edit/delete actions, tests, and results. Executes all items in the Actions node directly under Script Root. Recursively evaluates Tests and executes the Actions under the Pass or Fail result for each test. Executes all items in the End Actions node directly under Script Root. Note that if the Exit On Complete option is checked on a Test, no subsequent tests in the script will be evaluated.